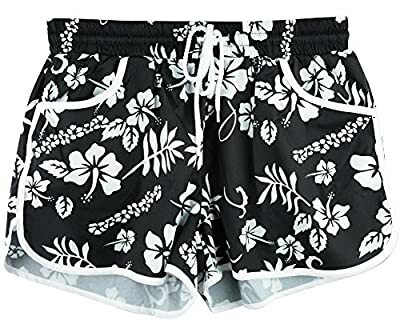 Women's Floral Beach Boardshorts Made by For G and PL. Cute and Sweet Style, Get an Eyecatching Look! S US(4-6) Waist: 26-28 Inches, Hip: 40-42 Inches, Length: 12.0 Inches. M US(8-10) Waist: 28-30 Inches, Hip: 42-44 Inches, Length: 12.5 Inches. L US(12-14) Waist: 30-32 Inches, Hip: 44-46 Inches, Length: 13.0 Inches. XL US(16-18) Waist: 32-34 Inches, Hip: 46-48 Inches, Length: 13.5 Inches. 2XL US(18-20) Waist: 33-35 Inches, Hip: 48-50 Inches, Length: 14.0 Inches. Womens Summer Floral Tropical Printed Boardshorts. Tropical Floral Print, Functional Front Pockets. Signature Scallop Hem, Elasticized Waistband with Drawstring. 1.We do Recommend Washing This Garment Inside Out on The Gentle Cycle with Cold or Lukewarm Water. 2.You Can either Tumble Dry Low or Line Dry. Material: Polyester & Spendex Well Made. Package Includes: 1 x BoardShorts, other accessories not included. FAST SHIP - Fulfilled By FBA Takes 1-3 Days. Fulfilled By Merchant Normally Takes 5-14 Days. SIZE INFORTMATION - S US (4-6) M US (8-10) L US (10-12) XL US (12-14) XXL US (16-18) .Detail Refer to Sizes in Product Description as Below. CUTE SUMMER SHORTS - Floral Printing Shorts With Side Pockects, Basic And Classic Style & Simple Design. CUSTOMERS?COMMENT?-? "Love these shorts! They fit true to size and flow nicely at hips. I'm 5'2, 140lbs and bought the medium in almost all colors! They are so lightweight, making the perfect to go over swimwear. They would be great shorts too!Can't wait to wear it this summer!". COLOR DISCLAIMER - Due to Monitor Settings and Monitor Pixel Definition, We Cannot Guarantee the Color That You See Will Be Exact From The Actual Color of The Product.